Ground effect hovercrafts are nothing new, but they don't get enough press. Basically they float above a special buffer of air pressure which exists above the ground, so they only fly a few feet above the surface of water. 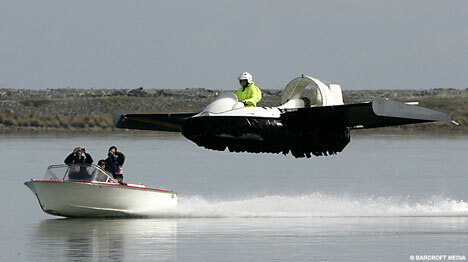 They are especially cool since you can get them classified as boats and go flying around without a pilot's license. If I had some water nearby and a few hundred thousand in loose change, I'd certainly pick one up. But I have a feeling they have some drawbacks we don't hear about, like when flying over choppy water..